A clerk can spend up to 40 hours a week JUST on agenda packets and duties – never mind everything else they have to do! Sound familiar? This is true for almost everyone in government! That’s why government needs to go PAPERLESS. 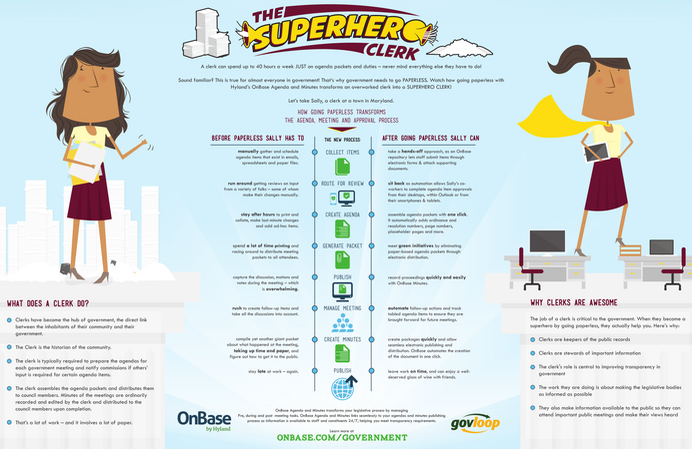 Watch how going paperless with Hyland’s OnBase Agenda and Minutes transforms an overworked clerk into a SUPERHERO CLERK in our latest infographic.